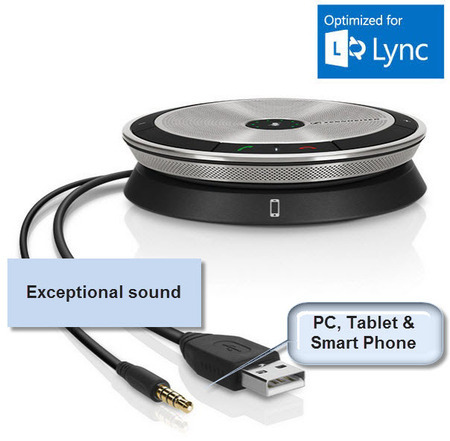 Sennheiser SP 20 ML is a compact, high-end portable speakerphone optimised for Microsoft Lync. This speakerphone has been created for business professionals who need flexible conferencing solutions and who demand exceptional design, excellent conference sound and user-friendly functionality. This premium Sennheiser SP20ML speakerphone is designed to be the BEST compact speakerphone in Australia. It's built-in cable system connects directly to your PC, smart phone or tablet. "I recently purchased a Sennheiser SP20 speakerphone from you. I had previously purchased a few Jabra Speak 410 units from you but bought the Sennheiser as you had no Jabra’s left when I came in. I just wanted to let you know that the audio quality of the Sennheiser is far superior to the Jabra and is worth the extra money spent. The actual unit feels a lot sturdier too and is great for a mine site environment. I like that it has actual push buttons, rather than touch buttons. I’ll be purchasing a couple more, online, based on the product quality. Thanks for the great service also, it’s been a breeze purchasing items from you." Sennheiser has a justified reputation for excellence - this is but another example. The SP 20 ML uses Sennheiser’s high definition sound quality, voice clarity and echo cancellation to ensure outstanding communications experience for user and listeners. Designed with the professional user in mind, Sennheiser SP 20 ML ensures an outstanding communication experience for listeners and users alike. The superior audio performance of this speakerphone enhances efficiency and the quality of collaboration in and between organisations. In addition, the SP 20 ML speakerphone features a dedicated music setting for relaxing with music between calls.